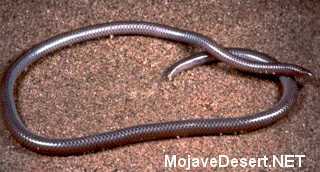 The western blind snake is widely distributed in southern California from the coast to the eastern border at elevations up to 1515 m (5000 ft). It seldom occurs in strictly sandy areas, alluvial flats or dry lakes. Little is known about abundance. A wide variety of habitats at lower elevations is occupied where conditions are suitable for burrowing, or hiding under surface objects and in crevices (Klauber 1940, Brattstrom 1953, Brattstrom and Schwenkmeyer 1951, Stebbins 1954, 1972). Feeding: This snake eats ants, termites, their eggs, larvae and other soft-bodied insects (Stebbins 1954). Cover: This snake burrows, spending most of its time underground. It has also been taken under objects such as logs, rocks and among the roots of shrubs. They have also been taken under granite flakes (Stebbins 1954). 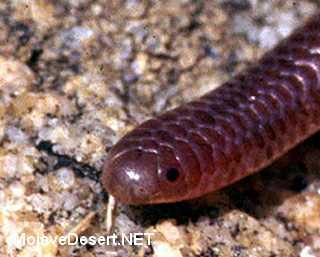 Water: The western blind snake seems to prefer moister habitats but is found in very arid environments, so permanent water is probably not required (Stebbins 1954). Pattern: This species prefers moist areas. In canyons, stony and sandy deserts, rocky slopes and boulder piles, and scrub. Activity Patterns: This snake appears on the surface at night but may be active underground at other times. Greatest seasonal activity occurs from April to August (Stebbins 1954). Reproduction: Little is known about reproduction. An average of 4 eggs (range 2-6) is laid in late summer (Klauber 1940, Stebbins 1954). Niche: There is one record of this snake preyed upon by a coyote (Stebbins 1954). It is probably eaten by most avian and mammalian predators when encountered. Nothing is available about diseases parasites or competitors. Brattstrom, B. H. 1953. Notes on a population of leaf-nosed snakes Phyllorhynchus decurtatus perkinsi. Herpetologica 9:57-64. Brattstrom, B. H., and R. C. Schwenkmeyer. 1951. Notes on the natural history of the worm snake, Leptotyphlops humulis. Herpetologica 7:193-196. Hahn, D. E. 1979. Leptotyphlops humilis. Cat. Amer. Amphibians and Reptiles 232. Klauber, L. M. 1940. 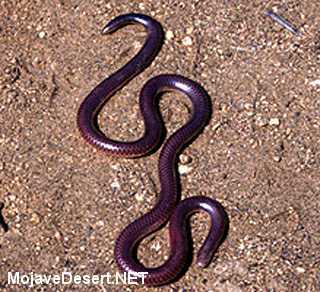 The worm snakes of the genus Leptotyphlops in the United States and northern Mexico. Trans. San Diego Soc. Nat. Hist. 9:195-214. Stebbins, R. C. 1972. California amphibians and reptiles. Univ. California Press, Berkeley. 152pp. Distinguishing characters: A thin cylindrical species with no neck constriction; blunt head and tail; purplish, brown or pink dorsum with silvery sheen; light venter; no enlarged ventral scutes; eyes vestigial, appearing as dark spot beneath head scales; spinelike terminal scale on tail tip. Juveniles: Similar to adults, except lighter in color. Similar species: Anniella pulchra: Has eyelids; black dorsal striping and black tail tip. Difficult to hold since they will squeeze out of hands. Excretes watery fluid that has a musky odor.